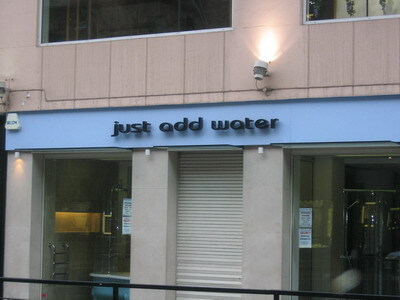 This entry was posted by Thomas Watson Steen	on Tuesday, May 30th, 2006 at 11:20 (GMT-1)	and is filed under Humor, justaddwater.dk, Signs. You can follow any responses to this entry through the RSS 2.0 feed. Both comments and pings are currently closed. Med al respekt for alverdens Lener, så er Liner jo af en helt anden støbning, hæhæ. God blog I har her!!! Just better hope that the fire is not in the stairs! “In case of fire, don’t panic and use the stairs” with a funny graphic. That is funny. I like the first one. Use stairs not elevator. That is just great. or would you run down into a fire? I totally get the top part where it shows that you shouldnt be using the elevator during a fire. However, I definitely agree that showing the people walking up and down the stairs in opposite directions is VERY confusing. Why would you go up the stairs in a fire? I guess if you were underground and needed to go up to the exit. But that’s all I can think of. In that case just make two different versions of the signs one for above ground and one for below. 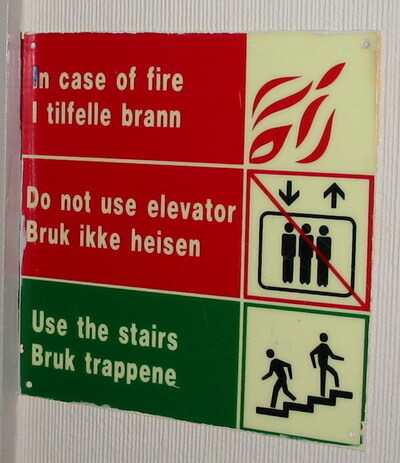 I love the way the Use the Stairs sign says run eitherway if theres a fire! Some great images! Thanks for sharing the funny signs. I think for the opposite directions image it could be up or down could be the way out. Keep up the great posts.